By completing hundreds of custom built thatches since 1999 Buildup has mastered the art of thatching. Building a thatch roof home has never been this convenient and risk free. Buildup’s professional team will guide you through the complete thatch homes building process. Expert advice and up-to-date thatch homes information will insure smooth transition in the required process, from drafting the first Thatch homes sketch to getting the plans approved. Build up’s professional thatch homes team will insure that customers get access to years of hands-on experience, latest technology advances in thatch roof construction and (the integration with) building specification. Material use in thatch roof construction is being improved on yearly basis resulting in Build up’s thatch roof having longer live span and low maintains cost. Thatch has been used for decades and is becoming more popular every year. When calculating cost of material to ratio of floor space, thatch roofs are extremely cost effective. The affordability and the esthetics of thatch make it the structure of choice for residential and commercial use. Material used to construct thatch roof is environmentally friendly and come from renewable sources. Thatch roof houses are monuments of the cultural diversity in South Africa and stand in harmony with the African sky from Western Cape to the Safari Lodges in the Northern Province. Build up thatch houses are as appealing as they are sound investments. A build up thatch house is the ideal environment for you and your family. A Build up thatch home is the best investment in thatch you can make. What makes a Thatch roof the ideal home, is not only the feel of warmth, mood, character, tradition and the relaxed homely feel it provides. Thatch is from Africa designed for Africa. 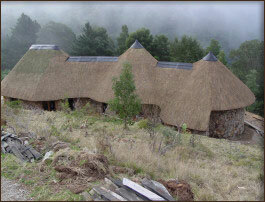 Thatch roofs are ideal for the South African extreme weather environment. South Africa doesn’t have the hottest or the coldest temperatures in the world, what makes SA weather so extreme is the fact that SA can have winter and summer in one day. Thatch roof homes are acknowledge as Eco-friendly in the residential home market. Eco-friendly homes are in demand and by generation X (people born between 1960 &1970) who are willing to pay more for Eco-friendly homes due to the environmental factors and that the managing cost of these homes are lower. The growing popularity in the home market, thermal advantages (Thatch keeps warm air out when hot and keeps heat in when it is cold), structural design, esthetics, low cost, and long life span are some of the reasons why you should invest in a BUILD UP thatch roof home today. There is no feeling like stepping into a thatch. Thatches are durable, attractive and Eco friendly.